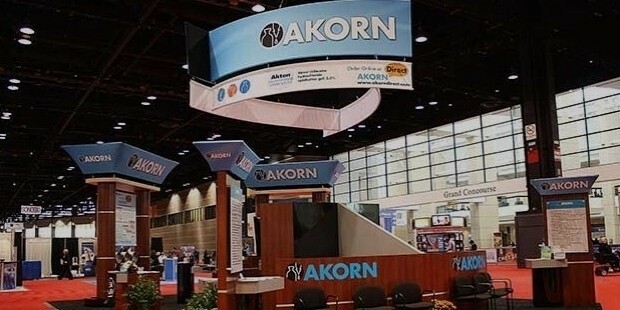 Akorn is an American pharmaceutical giant that deals in developing, manufacturing and marketing of generic and prescription drugs as well as animal and consumer health products. The company is listed on the NASDAQ Biotechnology Index and is functional in many countries across the world. It was founded by John Nath Kapoor, an Indian businessman based in the United States. He also leads the company as its Chairman and CEO presently, and also owns a major portion of its shares. The specialty of the company lies in producing difficult-to-manufacture sterile and non-sterile doses of ophthalmics, oral liquids, Otis, topics, inhalants, injections and nasal sprays. The corporation reaches the market through a wide number of distribution channels such as pharmacies, physicians, hospitals, vets, wholesalers, government agencies and other distributors. The company after its establishment in 1971 went on to expand its business by setting up Research and Development facilities in various locations throughout the United States. They are located at three places in the country; these are Copiague, NY, Warminster, PA and Vernon Hills, IL. These development units are responsible for carrying out various research-related projects of the company and coming up with better and new products in the market. Other manufacturing facilities of the company are spread across the world, mainly in the United States, Switzerland and India. These facilities come up with productions of antidotes, anti-infectives and controlled substances which help patients with pain management and anesthesia. The main product line of the company is divided into two basic segments. These are Injectables and Ophthalmics. Under the Injectables section, it manufactures a total of 37 products. Its Ophthalmics section is further distributed into two types which include Ophthalmics Prescription Drugs and Ophthalmics Over-the-Counter (OTC) Drugs. The former produces a total of 40 products while the latter is known for producing just 12. Apart from these, its other line of products manufactures a total of 4 pieces so far. The production of its Injectables is carried at the facilities in Illinois and India, while the production of Ophthalmics at the one located in New Jersey. The products manufactured under the Injectables section consist of dosage forms such as ampoules and vials and products that are liquid and Iyophilized. Cephalosporins, penems, hormones and general injectables are the ones which are also manufactured under this segment. A total of 25 team members, are responsible for the promotion and sales of these products. Under the Ophthalmics segment, the dosage comes in the form of solutions, gels and ointments basically. The products manufactured are related to branded and private prescription as well as OTC Ophthalmics. A total of 40 members are employed on the sales team to promote these products to clients across the world. The company has been able to maintain its image of a well reputed brand ever since it was launched and has received many awards for the same since its inception.